There are many Japanese kigo related to this kind of early cold rain in the overlapping time from autumn to winter. According to the weather patterns of this season, when cold air masses come down from Siberia, the rains come and go fast, as is represented in the Chinese characters, meaning "rain for a (short) time". It might hit you unexpectedly on a mountain pass and leave a thin white cover on the peaks. Most common in Northern Japan, these showers come fast and leave fast, so it may rain here and shine there (kata shigure　片時雨). The short cold drizzle evokes many melancholic feelings for the Japanese haiku poet. It is a symbol of the passing of events in the human life, of the passing of life itself. It is also something that can be enjoyed hearing, it makes a hushing sound and this kind of sound is reflected in other kigo, for examle the famous cicada shrilling (semi shigure　蝉時雨). I often go to our local shrine and listen to the shigure on the roof, quite an eeerie sound! These drizzle kigo have mostly been used already since the Heian period and are well loved and full of allusions to famous poems. SHIGURE is a good example to show that kigo are much more than just the weather report. 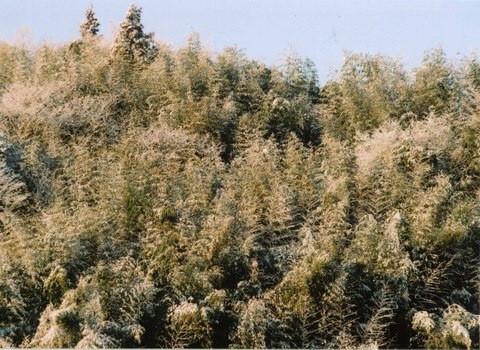 The sound of sleet sounding on the thatched roofs of a village in the Edo period. .. all expressions known since the Heian period.
. Yamanikami 山の神 and Legends from Fukushima . This hokku was written at the end of the 10th month (November) in 1803, while Issa was staying at the house of a student in the area just east of Edo. The meaning of keshikaranu in the first line is a bit complex. Keshikaranu literally means "not just unusual," that is, extreme, very bad, awful, terrible, suspicious, weird, very strange, or just "very X,Y,Z." In Edo, where Issa was living, keshikaranu meant the equivalent of modern Japanese hidoi (severe, intense, hard, frightful, outrageous, terrible, dreadful) or taihen da (terrible, awful, very serious, countless, enormous, disastrous; often used as an exclamation). I take Issa to be exclaiming at the sudden sleet storm that takes place while the moon is still out, as if he were talking to a companion or to himself as he takes cover. The next hokku in his diary evokes someone sweeping away sleet from the ground near a house, so a fair amount of sleet must have fallen. The two-story Shigure-den (Autumn Shower Palace) in Arashiyama is a museum where people can experience and learn about the Hyakunin Isshu. This building is two storeys high. In the main room, there are many 45-inch, liquid-crystal monitors that display 70 large karuta cards and images of the city of Kyoto on the floor. You can take part in several activities here. ©　Kyoto University of Foreign Studies. Although Mt. 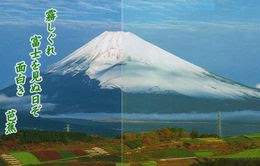 Fuji is unseen.
. Getting Old with Haiku . This hokku is from the 9th month (October) of 1821, when Issa was in his hometown. Shigure are intermittent short, hard, cold rain showers, sometimes short squalls, that come one after the other in systems of fast-moving clouds in late autumn and early winter, though occasionally they occur in spring and summer. In waka they are often referred to as capricious or unreliable. Just when blue sky returns and you think the showers are over, another one begins pelting down, and just when the rain seems to be falling harder, it stops. These continuous intermittent showers are different from steady cold rain or from late afternoon downpours (yuudachi) that soon leave the sky clear. 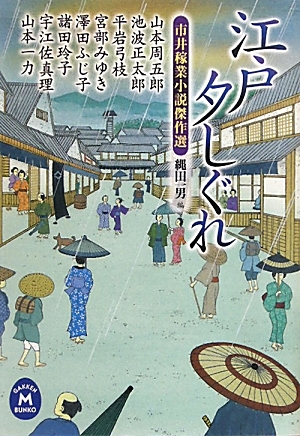 In Issa's time these cold rain showers were regarded as either a winter or an autumn image, depending on the context or the other images in the hokku. This hokku by Issa happens to be an autumn verse because it's from the 9th month. The cold showers in 1821 seem to be quite vigorous, and to Issa the never-satisfied rain seems to obsessively and fastidiously fall in irregular bursts that again and again defeat human expectations. his poem is considered an original work, for that one word, that one small change, alters the whole. The new poem thereby establishes roots, and strengthens the roots of its predecessor, in the native tradition. Translators constantly make such changes; this is unavoidable when one is transferring data from one language into another, for there are no perfect inter-lingual synonyms. Is their work not therefore original? but I feel like I've been there, now. in the sleet . . .